PORTLAND, Ore. -- In what is likely the final major hearing before a federal judge decides what must be done to make Columbia River dams safe for salmon, lawyers argued Monday over just how many salmon have to come back and whether that satisfies the Endangered Species Act. The answer is difficult, because the numbers fluctuate widely from year to year based on how much food is available in the ocean, no matter how many billions of dollars are spent making dams less lethal to fish. The hearing in an overflowing Portland, Ore., courtroom was perhaps the final argument in a fight that has raged since 2001 over what is called a biological opinion -- a formal review required by the Endangered Species Act as part of the effort to reduce the harm federal projects such as dams cause protected wildlife such as salmon. U.S. District Court Judge James Redden previously shot down two Bush administration plans for restoring salmon runs and is now considering whether minor improvements offered by the Obama administration giving biologists more flexibility to react to problems are enough to make the plan work. The battle comes down to a choice between cheap and abundant power provided by hydroelectric dams on the Columbia and Snake rivers in Oregon, Washington and Idaho, and the many salmon the dams kill as the young fish migrate to the ocean and swim upstream as adults to spawn. The more water that goes through the dam turbines, the cheaper the electricity to farmers and electric ratepayers. When more water is allowed to spill over the tops of the dams, more salmon survive. 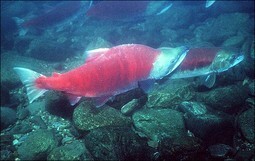 The central argument by conservationists is that the current plan sets too low a bar for salmon survival. "The government tries to work its way around the problem," said attorney Todd True of the conservation group Earthjustice. "But there is a fatal disconnect in the argument" that growing salmon population numbers equals recovery. Government attorneys countered that the plan is enough to assure salmon survive, and conservationists are missing the point. The numbers of salmon fluctuate year to year, said U.S. Justice Department lawyer Colby Howell, and it's impossible to know whether the numbers the court is using represent a valid picture of what salmon populations should look like. He said ocean conditions and river management play a large role in salmon runs. The plaintiffs are "playing a game of back-and-forth where they're making up the rules," Howell said. National Oceanic and Atmospheric Administration deputy regional administrator Barry Thom said outside court that the government might never make the conservationists happy. "I'm not sure we can," Thom said. "They're willing to do anything to push for dam breaching. That seems to be the heart of their argument." Conservation groups and some Indian tribes have long argued that restoring a free-flowing Snake River by breaking through four dams in Eastern Washington is the only way to bring struggling salmon runs back to thriving instead of just surviving. One biological opinion by the Clinton administration put that prospect on the table, but the Bush administration took it off. The Obama administration has said it might study dam breaching as a last resort if other steps fail. Conservationists argue the government's projections for improving salmon populations have failed before. Habitat improvements planned from 2007 to 2009 were often delayed or proved infeasible, and there was no effort to relate the habitat improvements that were made to increased salmon survival. Salmon advocates say the latest revised plan from the Obama administration is little different than the Bush administration's 2008 plan and has little scientific evidence to back it up. "If the fish are not replacing themselves, there's only one thing they can do," True said. "And that's go extinct." Oops! It turns out that handing these out in a federal courthouse may be illegal and the bailiff asked me to stop after a complaint was made by an unknown attendee.